Today kicks off the start of the 2017 Vail Resorts Employee Engagement Survey. This morning you should have received an email inviting you to take the survey. I’d like to strongly encourage you to spend a few minutes providing us feedback. The anonymous scores and comments that are provided by the 3rd party administrator (Towers/Watson) has provided valuable information that we have acted on in the past several years. 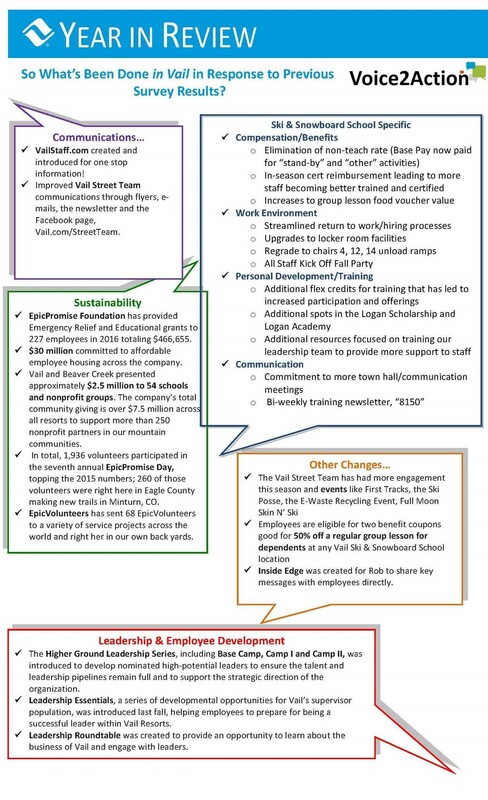 Below is a sample of the many improvements that have been made based on the information as a result of the survey. I have highlighted Compensation/Benefits, Work Environment, Personal Development/Training, and Communication as areas that we’ve made great strides.